Cincinnati’s Sephardic community purchased a cemetery plot for $600 cash in Price Hill on October 29, 1920. This marked the beginning of the Spanish Hebrew Society Cemetery, Cincinnati’s sole Sephardic cemetery. The money had been raised through “nickel-and-dime” donations gathered from the Sephardic community, the earliest members of which had begun migrating from Turkey in 1906. The Sephardic Jews were known at the time in Cincinnati as “Jerusalem Jews,” to the rest of the community. Their customs and culture differed greatly from those of the Ashkenazic community and the Sephardic community was regarded as being somewhat removed from the greater community. When a Sephardic Jew would pass away, it was difficult to acquire a plot in one of the Cincinnati Jewish cemeteries. This lack of welcome would later contribute to the tightly-knit Sephardic congregation and community and their need to create a cemetery of their own. 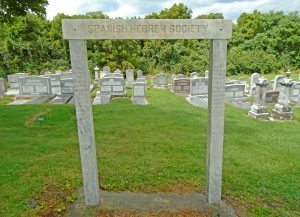 On October 1, 1921, the Spanish Hebrew Society was officially formed to tend to all aspects of Sephardic life in the Cincinnati area. Monthly dues were raised from 10 to 50 cents to ensure that all members had free plots in their community’s new cemetery. Their cemetery, Spanish Hebrew Cemetery, is located in a small plot of land within the Love Brothers Cemetery. The early days of this new Spanish Hebrew cemetery contain some interesting stories. In 1919, for example, Hayim Hassid was buried in Judah Touro Cemetery, also in Price Hill. Hassid had come from Turkey after serving as a court jester under the reign of Abdul Hamid II, during Ottoman rule. Hassid, who was only 30 inches tall, immigrated to Cincinnati to be with other Jews he knew from Salonika. According to his obituary, he later performed in a “side show” to earn a livelihood. In his last months, he stayed at the home of Leon Benmayor, an early prominent member of the Sephardic community, now buried in Spanish Hebrew Society Cemetery. Prior to the building of the congregation, the Sephardic community met every year on High Holidays at a makeshift synagogue in the basement of the JCC on Clinton, near Central Avenue. Women took charge of finances and fundraising for the congregation, while men took control of the other remaining tasks. As the Sephardic population in Cincinnati grew, the members’ next mission was a building campaign. Every Rosh Hodesh (beginning of a new month), two committed members went around to Jewish homes, both Ashkenazic and Sephardic, to collect donations from the community. Rabbi Eliezer Silver took charge of the project of building the future Beth Shalom Congregation, soliciting companies for specific donations, such as glass for windows. Much of the materials were acquired through donations. The Sephardic Beth Shalom Synagogue was inaugurated in 1933, on Manss Avenue in Price Hill, to serve this growing community. Once the synagogue was built, the congregation thrived, as now the community could gather regularly and observe all holidays and customs of their tradition. The congregation only grew from there, especially after World War II, when many refugees from Greece came to Cincinnati. After 80 strong years, the synagogue closed its doors in 1993. Rabbi Isaac Jerusalmi, an influential leader in Cincinnati’s Sephardic community, was born in Kuzgundjuk, Istanbul and was raised in a Ladino-speaking family. After completing his studies at Hebrew Union College, Jerusalmi was ordained as a rabbi in 1956. He then returned to Turkey, where he served as an officer during the Korean War. Rabbi Jerusalmi then went to Paris, where he obtained a Ph.D in Aramaic Inscriptions. In 1963, Rabbi Jerusalmi began teaching at Hebrew Union College in Bible and Semitic Languages. He was passionate about preserving the Ladino language and Sephardic culture. Through this passion, he served the Sephardic community in Cincinnati, acting as Haham, the traditional Sephardic title for the rabbi of the community, overseeing the congregation and the Spanish Hebrew Society Cemetery. 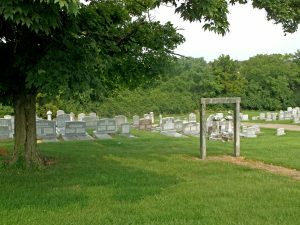 The Spanish Hebrew Society Cemetery officially merged with JCGC in July 2018.